Meet Rhea Kanwar, Thirty, unmarried and tending to fat. One morning Rhea realizes it's time she did something about her life, or she'll turn into Bubbles Auntie, her mom's best friend, who says things like, 'I'm a recycled virgin.' Bubbles Auntie also has to be invited to every family celebration, because 'she has no one'. So Rhea dives into the marriage market. Each time she meets a new guy, he's perfect, but then each guy has a weirder problem than the last. Vyash freaks out when he realizes Rhea isn't on the pill, Jay has a KEWL tattoo, Mazher might be too much of a gentleman and Sid is really, really bad in bed, but practically perfect outside it. And then there's Art, her best friend she's been in love with all this time. How is she going to choose? 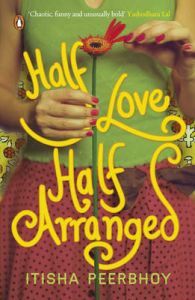 Awash in caricature and banter, Half Love Half Arranged debuts a voice that could well be the next Anuja Chauhan. Itisha Peerbhoy continues to live in deep regret that she didn't become a zookeeper. However, being able to write this book has done a considerable amount of soothing, elating and pep-talking to her animal poo deprived nerves. She lives in Bangalore, travels to Bombay as often as she can to visit her childhood home and channels her inner Delhiite to any ‘Southie' who will listen. This is her first book and she is currently working on her next.